What's more, it contains powerful peptides for long lasting skin improvement, making it an all round winner. I'm a big fan of eyesential and didn't want to change. When I bought my last bottle I though give BlackMagic a try. I was pleasantly surprised, it does everything what eyesential, and more. Well done Skinov8. 5 stars. Cleanse face thoroughly and gently pat dry. This is a very important first step in achieving optimum age-defying results. Before the first use, you may need to press the pump a few times before the product comes through. Dispense a small amount of Black Magic Instant Wrinkle Eraser, slightly larger than the size of a dime, into palm of hand. 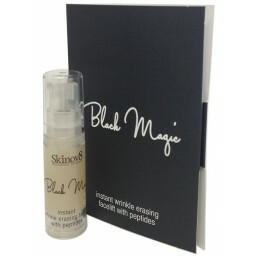 Using your fingers, lightly tap Black Magic Instant Wrinkle Eraser over areas of concern on face and neck, and smooth on a very light layer. 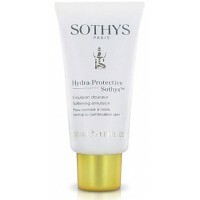 Make sure that you close container properly when finished, otherwise the serum will dry out. After applying the product you need to keep your face expressionless for about two to three minutes while the Black Magic Instant Wrinkle Eraser dries. You may experience a slight tightening sensation which will disappear soon. This is a sign that the product is working – as it is settling into the pores, lines and wrinkles and is beginning to dry, simultaneously tightening your skin. After the Black Magic Instant Wrinkle Eraser has dried completely, check the perimeter of targeted areas. 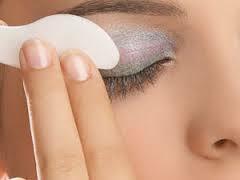 If there is any residue noticeable, lightly pat over area with a damp finger tip and let air dry for several seconds. You may now apply water-based makeup if you wish. A good way to trial a product without excessive cost. You can certainly feel it working. Still figuring out the best way to use with my B.B. cream. Thank you for your review. Based on your comments, it appears that you may have used too much product. The 5ml in the travel sized bottle should be enough for 10-20 applications. In regards to the white residue, if you applied the right amount of product a little bit of tapping with a damp finger should suffice. You don't need to take it all down and reapply. Please let us know how you go with the rest of the product, if there is any left. The pump didn't work, so had to get the cream out manually which was annoying. The product works well though. Hoping to have better luck with the full sized bottle. A great product. Found that there was no white residue and very easy to apply makeup over the top once the product dries leaving the skin looking fresh. Was a problem with the first one I purchased as the pump didn't work properly and there was still plenty left that wouldn't come out. I bought again as I really liked the product. So far so good, I really like it. No white residue as with other products and make up goes on nicely. I have a tendency to puffiness under my eyes, and this product visibly shrinks them as nothing else has done, including 8 hrs sleep, no alcohol and 3 L water every day! Great product, when you get the hang of application, smoothes those eye lines and dark circles. Dear Susan, Thank you for your feedback. Did you apply water-based make-up? If you mix a bit of Black Magic in your water-based foundation, you should achieve the desired result. After the Black Magic has dried off, you may apply blush as well, but with light brush strokes only, so as not to ruin the facelift effect. very good product no wonder it is a bit costly u get what u pay for so they say. Worked straight away but have problems when using makeup over it. it tends to lose some of the effect. I am very happy with Skinov8 Black Magic. It does smooth most of the wrinkles away like magic. The only thing is that it makes my skin feel tight. I have decided to try MirApple products next to see if they will make my skin feel softer. I am honestly not sure if it made an improvement or not. I am 58 and maybe have left it too late to try to improve my skin. Anyway, I will keep trying with the travel pack and maybe get better at it. I love it! I have recently purchased this product and was quite skeptical because I have tried a couple of similar products. This product actually works! I love it! I have recently purchased this product and was quite skeptical because I have tried a couple of similar products. This product actually works! It even gets better the more often you use it. 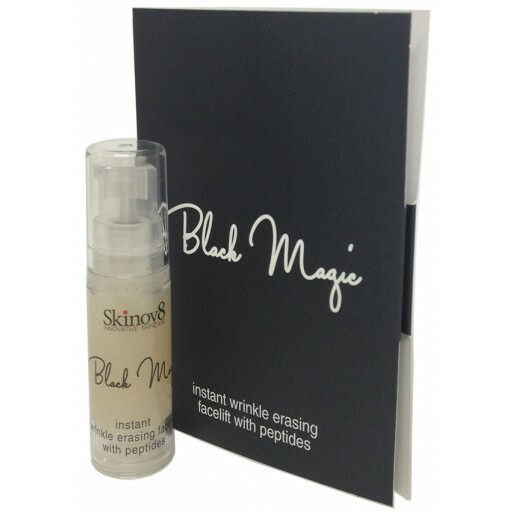 I have noticed a real difference and am so happy with my skin0v8 black magic, it is now part of my daily regime. I am very happy with my instant "facelift in a bottle". Works well under makeup for a fresh look to my skin. Within seconds I could feel this product working to smooth out the lines around my eyes. The tingling, tightening sensation meant the product was working.